Tonight on NBC their hit reality talent show AMERICA’S GOT TALENT returns for the eleventh episode in its ninth season of the acts who perform last night we will find out who is moving to the semi-finals. On last night’s episode, 12 of the top 47 acts this season performed and got the chance to go big and immensely entertain the audience in Radio City Music Hall. Tap dancers Sean & Luke opened the show with their dynamic routine and backed by a troop of female dancers. 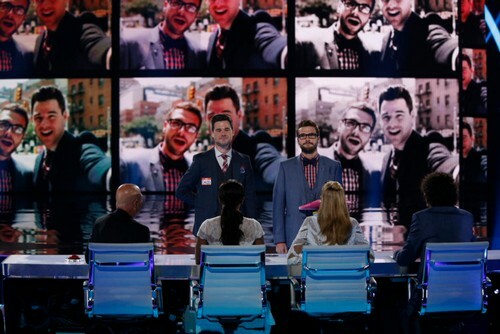 The Chicago boys tried to elevate their routine to impress the judges but fell flat for celebrity judges Howie Mandel, Mel B, Heidi Klum and Howard Stern. Did you watch the last episode? If you missed it we have a full and detailed recap, right here for you. RECAP: Tonight is elimination and only 5 acts are going through tonight, we will be seeing who America has decided to put through to the next round and who’s dreams they have destroyed. All these acts have worked so hard to get to where they are now and none of them are ready to go home, all of them want it badly; but reality is only one can win. We now get a recap of all of the acts last night, giving us one last glance at the acts and that two of them will surely be going home tonight; will your favorites go through or will their be some upsets tonight. The first act of tonight going to the semi finals is Emily West with her beautiful singing performance last night. Howard says that when Emily sing he remembers her voice and spent the whole day singing it because of how memorable she is. Heidi says she is so happy for her and that her performance is flawless. Howie is now talking about his life story to the three other judges on a tour bus ride; the judges are yawning and Howie decides to go down the bus and take a picture with a fan on his star. We now see an episode of Jimmy Fallon and Heidi together. We now see Enrique Iglesias performing on stage. The next act moving on to the semi finals is Dan Naturman the comedian with his hilarious act last night. Howie knows Dan will have an amazing career ahead of him and really wants to see him go far in this competition because he’s an amazing comedian. The third act going into the semi finals is Miguel Dakota for his singing last night. Heidi is very please and knows he has a lot of potential and a lot of charisma; though says Howard is right and he must be stronger on the vocals. We have three acts left but only two spots for the semi finals; the first act going through David and Leeman who did an amazing job at manipulating America last night. Now the last two acts are for the judges to decide, we take a look at Baila Conmigo and the Flight Crew Jump Rope’s performances last night to give them a reminder of who they want. Heidi says she gives her vote to Baila Conmigo, Mel B decides that Flight Crew Jump Rope will be her choice though. Howie says he was amazed at how fast Baila Conmigo’s speed and believes that they deserve his vote. It’s now down to Howard and he feels the pressure because it’s up to him and he decides Baila Conmigo deserves to go to the next round.